 A scholar's thought-provoking and persuasively documented challenge to the utilitarian assumption that money is simply a fungible, impersonal medium of exchange. Zelizer (Sociology/Princeton) draws on a wealth of unconventional sources (etiquette guides, immigrants' handbooks, newspapers, vaudeville routines, women's magazines) to show that money is a many-splendored instrument with both cultural and economic significance. While she gathers her evidence mainly from an American era that began with the post-Civil War expansion and ended during the Depression, the author leaves little doubt that her findings apply equally to other times and places. In aid of her thesis that commercial enterprises and government agencies as well as individuals distinguish among forms of legal tender, she first examines how money was ``earmarked'' (i.e., allocated) in domestic households at a time when the US was becoming a consumer-oriented society and comparatively few women worked for wages. Moving on to optional largesse (including tips and bonuses), Zelizer points out that it matters how gifts of money are spent; the recipient of a birthday check, she observes, is not expected to buy groceries with it. Covered as well are the running battles that pitted welfare authorities against the poor, who found ways to subvert bureaucratic restrictions designed to keep them from apportioning relief funds for burial plots, fraternal organizations, or other putatively inappropriate expenditures. While the Social Security Act of 1935 advanced the monetization of public-assistance programs, the author notes, the contest for control of domestic budgets continued unabated. 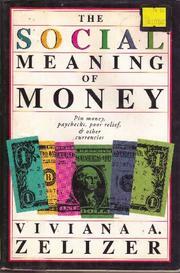 In evaluating this and allied aspects of money's infinite variety as exemplified by such currency equivalents as casino chips, food stamps, and tokens (plus the divergences between an allowance and a salary, honorariums, and related anomalies), Zelizer concludes that multiple monies are a central feature of advanced capitalist economies. An illuminating, on-the-money audit of a protean commodity that's largely taken for granted.